You'll be wearing your wedding ring for the rest of your life so it's important to choose wedding rings that both your and your partner will enjoy wearing. They'll have to be comfortable, stylish and timeless and represent what they mean to one another. Of course 24k yellow gold is the purest gold you can get but it is also the softest so not often recommended for wedding rings. 18K or 14k are much more durable and likely to stand the test of time. White gold is also another popular choice as it will compliment any silver or platinum jewellery you already have. However it is plated to enhance its appearance so white gold can grow dull with age. A platinum wedding ring will last a lifetime but it is much rarer than gold so it is more expensive. A more modern choice is a titanium wedding ring. It's very durable so can resist carving without losing its strength. The main consideration to the bride is how the wedding ring sits with her engagement ring. Talk to your jeweller when going out to buy your wedding rings they'll be able to suggest something that sits perfectly with the engagement ring. Most rings can be bought off the shelf to suit the engagement ring but if you are really struggling to find the perfect ring then your jeweller can custom make your ring. Times have changed and wedding rings don't have to be simple and plain any more. It's getting more and more popular to have gems and jewels set into the band, especially for the bride. Of course diamond set weddings rings are the most popular. If you are getting a custom wedding ring then do check how long it will be before they'll be ready, the last thing you want is for the creation of the wedding rings to over run the actual date of the wedding. A wedding ring may have been passed down from family members, if it is the case then it is likely it will just be the bride or the groom, rarely both. So if one of you have a ring that's been passed down it is a good idea to match your partners to it. This is where your jeweller will be able to help. 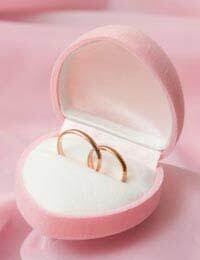 You may not want to have exactly matching rings so ask what will compliment the heirloom ring. It might be a nice idea to get your initials carved into your rings. There is also a new trend emerging of getting words written backwards on the inside of the ring so the real meaning only shows up when it is pressed against the skin. This is a lovely, personal way of getting your private message across. Or, you can get messages of love written along or around the inside or outside of the band. Giving the wedding rings a real personal touch that no one else will have. Remember to choose rings you are both happy with. Don't listen to what other say just choose rings that symbolise what you think of one another and how you feel.